Soldering irons are tools that supply heat to melt solder so that it will be able to flow into the joint between work-pieces. The market is filled with various different types of soldering tools. Choosing the best soldering iron depends on the way that you will use it, your skill level, your quality requirement, and the type of projects that you plan to do. The most crucial element of this soldering station is the pencil iron featuring an ST3 iron-plated copper tip. The cushioned foam grip of the iron will ensure comfortable work for more extended periods of time. The pencil iron also comes with a replaceable heating element, and this will allow you to use the same tool for a very long time. Basic soldering kits are usually complicated to adjust, but this particular one includes a variable power control that allows you to adjust the power level with just one turn of the knob on the base unit. You can adjust it between 5 and 40W. The power control offers you the opportunity to choose the perfect setting appropriate for each and every project that you are working on. To prevent you from leaving the iron hot by mistake, the base also comes with a power-on indicator light and an on/off switch. The station also includes a built-in iron stand for a more organized workspace and a sponge tip cleaning pad perfect for keeping your tip clean and ready for any job anytime. High-quality accessories for increased performance. 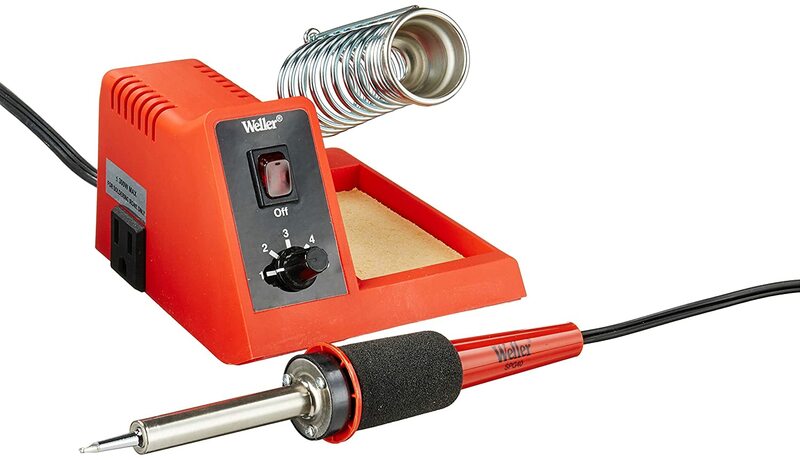 The Weller soldering station comes with an ST3 iron-plated 1/8-inch screwdriver tip and a vast palette of compatible St series tips for various applications. The tips are made of solid copper, and they’re plated with iron, nickel, and chromium for better protection against solder creep and corrosion. This will result in an enhanced reliability over time. 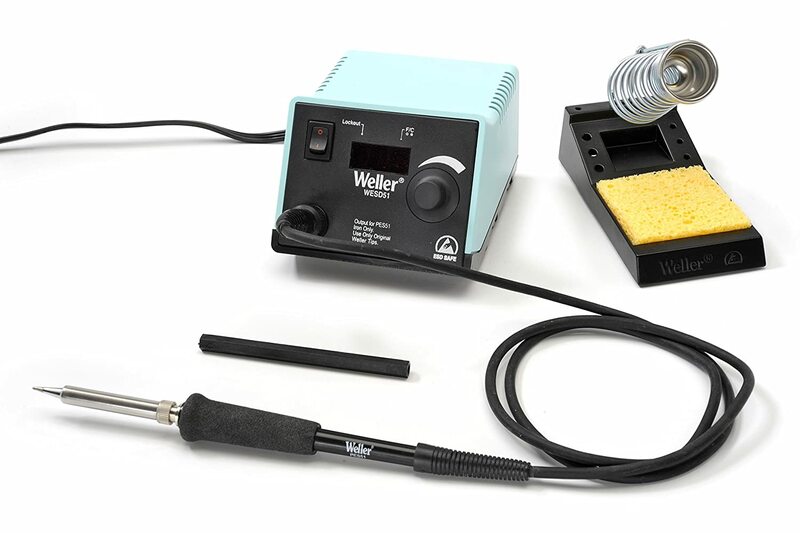 The Weller soldering station has been UL-listed, and this means that it has been tested to meet all the necessary independent safety standards. It also comes with a one-year warranty. The station’s cord can get in the way sometimes, and this can be irritating, but if you make sure to set it up so it stays out of your way, you shouldn’t have any problems while working. The X-Tronic soldering iron station is perfect for both beginners and experts, and it has lots of features for extended durability and high-quality. The 75W soldering iron station comes with an ergonomic heat resistant grip featuring a temperature range of 200°C-480°C/392°F-896°F. It also includes a 60-inch silicone cord that goes from the tip of the soldering unit to the main unit. The unit includes a bright blue LED tube display, and a C/F function, and you can easily change the LED digital readouts for the temperature with just a single flip of the switch. The PID tech is usually referred to as Magic Temperature Compensation Technology. This maintains the temperature stability on the tip of the unit. It doesn’t come with a tip cleaner, but if you get one yourself, there won’t be any problems. Other than that, all the accessories that are included do an adequate job. 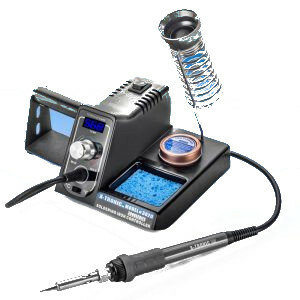 This digital soldering station is a mix of an innovative heater and sensor combination that provides rapid heating and fast temperature recovery among other useful features which makes it possibly the best soldering iron we reviewed. The unit’s wireless temperature lockout is built to prevent the operator of the unit from raising the temperature levels higher than recommended for the component or board. This will result in increased control over the temperature. The station is set to shut itself down after 90 minutes of inactivity automatically, and this will result in a longer lifespan for the tip and a power-saving feature. The unit’s electronic control system allows you to set the perfect temperature that you need to get your job done flawlessly. The soldering temperature can be adjusted from 350 to 850 degrees Fahrenheit, and it is also measured accurately to within 9 degrees. The unit’s high-quality built-in heater and sensor combination will provide quick heat-up time and temperature recovery for better control over heat. The slim and comfortable pencil comes with an ETA tip built to minimize the user’s fatigue. The pencil works a bit difficult for more significant tasks due to the amount of heat required, but, on the other hand, once you set the iron to the desired temperature it will remain the same no matter what you are soldering. There are several important factors to consider before you decide to buy. It’s important to consider all of your requirements, so you purchase a good soldering iron. For starters, you should take into consideration the wattage of the soldering iron/station. Most irons that are used for electronics are between 20 and 60W. One of the most popular soldering irons is the one with 50W because this model provides enough heat for most soldering projects on the circuit boards. Usually, the higher the wattage, the better a soldering iron is. But if a product features higher wattage, this does not necessarily mean that it will also apply more heat to the solder joint; it just means that the tool has increased power available. A soldering iron with low wattage, 20 to 30W, will lose heat much faster than it is able to re-heat itself and this will result in poorly made solder joints. Another essential factor to be considered before purchasing your soldering iron is the type of tool that you will need. There are four main types of soldering irons: soldering pencils, soldering stations, soldering systems and soldering guns. Usually very simply constructed and it is used for easy projects. They don’t provide temperature control, and this is important because when you apply too much heat during the soldering process, you can damage the components on the circuit board. include a soldering pencil attached to a power station. The power station provides you controls for setting the appropriate temperature. Some stations come with electronic temperature control and they automatically keep the iron tip at the best temperature. also known as rework/repair systems are more complex soldering tools and they are mostly used in the industry or the manufacturing facilities with high volume. A soldering system includes a few handpieces such as a soldering iron, a hot air gun, a de-soldering gun, thermos-tweezers and so on. are transformers that convert 110 V AC to a much lower voltage. These tools can be quickly turned on and off, and they feature a short warm-up time. It’s worth mentioning also that if you’re anything like me, then you probably have a ton of tools lying around creating a mess. That’s why it’s a good idea for you to get some kind of storage to help organize your tools. Here’s a guide written by our friends to help you choose a tool chest or tool box to store everything in. Temperature control is the last crucial element to be considered before buying a soldering iron. Most soldering tools come with three basic temperature designs. 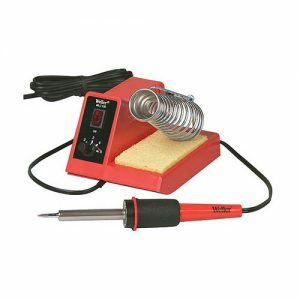 Soldering irons with no temperature control – and these are used for household basic soldering projects. The temperature-controlled soldering iron – which will allow you to make sure that the soldering iron’s tip keeps its appropriate temperature. The third temperature design is used by the soldering stations that usually offer digital temperature readouts and adjustable iron temperature among more handy features. The best soldering iron for your individual case should strike a balance for the performance you need, and your budget. While some soldering kits come with all that you’ll need to get started, you might want to consider purchasing some accessories to complement your setup. Even with the best soldering iron it’s great to have some additional tools. Some accessories are optional add-ons, and others are necessary to get anything done! So let’s take a closer look. On a side note if you’re looking for technology for better purchasing decisions be sure to read some good tech reviews. To clean the tip of your soldering iron, it’s a great idea to have some steel wool. 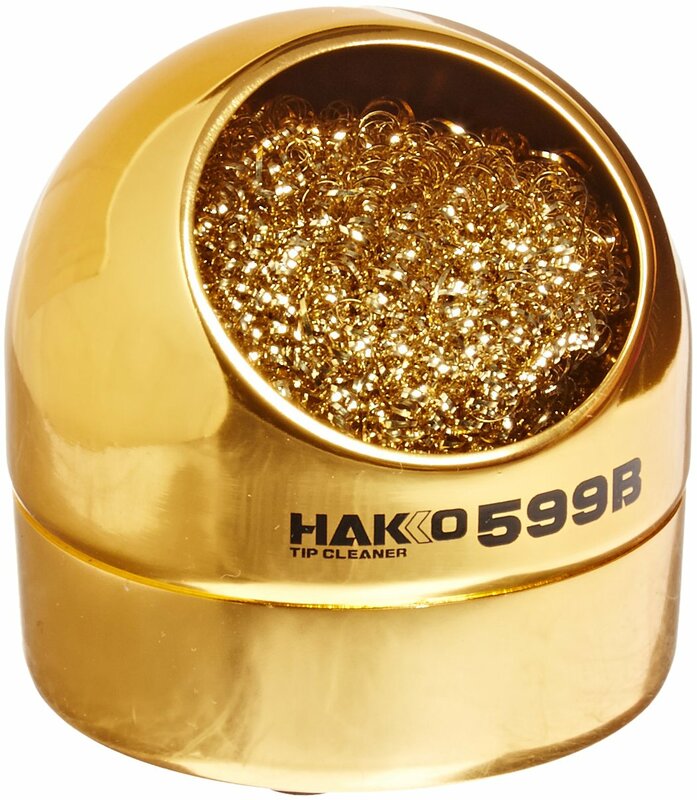 You can purchase specifically built steel wool tip cleaners from Amazon. Another option is to use a sponge, preferably wet. However – steel wool is generally more effective. In order to make any use of a soldering iron you will need some solder! There are a few options to choose from so let’s take a more detailed look. You could use leaded solder, which has the benefit of being easier to use. This is because it’s melting temperature is lower. However most people prefer lead-free solder for health and safety reasons. Another question to consider is what size of solder wire you will need. In most cases anything between 0.7mm and 1.6mm is fine. 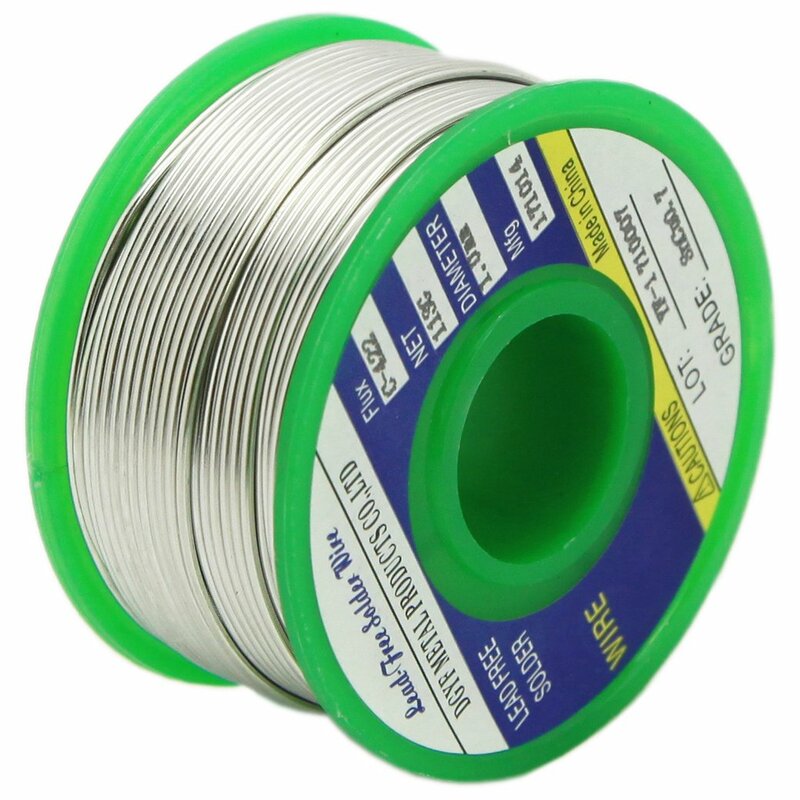 Larger solder lasts longer but lacks the level of precision that you have with the smaller wire. For the average user, and the beginner we would recommend 1mm solder. It has a good level of precision while not compromising on ease of use. We only have two hands, and sometimes that isn’t enough. It’s a great idea to get a tool called a “third hand”. 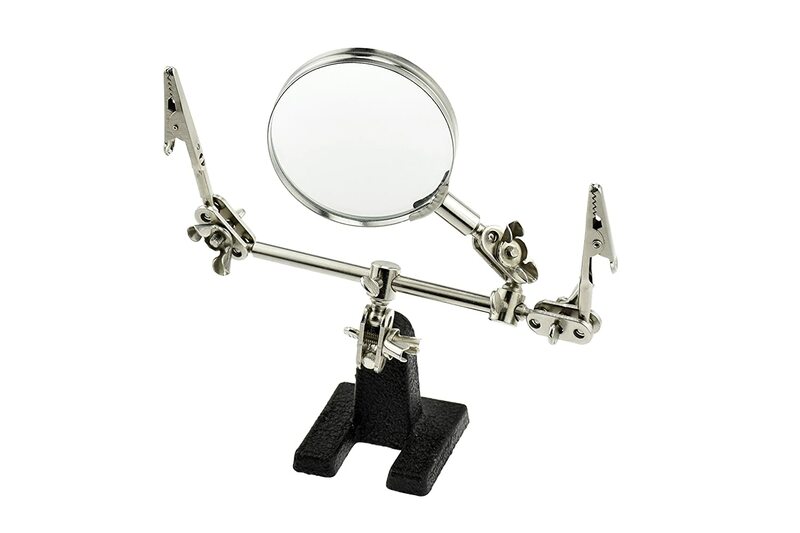 This tool is used when you need to hold two or more components together AND hold your soldering iron. It works by using alligator clips to grasp the work-piece. This add-on is cheap and honestly makes the task so much easier, so it’s definitely a worthwhile purchase. Are you sick of spending money on brand new charger cables, phones, and TVs when they go bad? You don’t have to break the bank to keep your life functional. With just one little tool, some time, patience, and practice you can repair all of these things yourself! What kind of tool can repair countless everyday staples and even improve them? A soldering iron. At some point, you’ve probably seen one in a DIY project or on the desk of your computer repair tech. For most people, it’s something that no one thinks about until it’s needed. They are one of the most underrated hand tools! The main problem is that a lot of people don’t know how to use a soldering iron. After a little bit of practice, you’ll wonder why you never had one before! Before you run out and buy one, be sure to check our reviews above. There you go – now get to practicing! You’ll learn how to use the soldering iron to make jewelry, make your phone charge quicker, and much more! There’s so much you can do. However, since soldering irons get so hot, there are a few things you should keep in mind. Solder comes in different widths and types. Make sure you buy the right one for your project. Or practice with DIY beginner soldering kits! With these simple safety rules in mind, you can learn a new skill that will expand your creative side. Once you get started, you’ll surprise yourself at what you can mend, create, and upgrade. What are you waiting for? 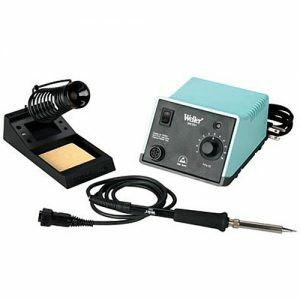 My top soldering iron recommendation is the Weller WLC100 40-Watt Soldering Station due to its high-quality feature roundup. The unit’s durable and easy-to-control pencil iron, its high-quality accessories and the easily adjustable power control will make completing your job easy and efficient. Therefore in my opinion this is the one of best soldering stations to buy.